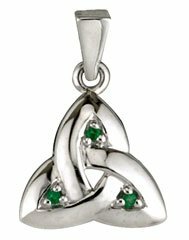 Our white gold Celtic cross pendants are all handmade by master artisans. Each pendant is then stamped with a hallmark stamp from the Assay Office in Dublin Castle. This stamp authenticates all our Celtic jewelry as Irish made jewelry and also guarantees the purity of the metal. This is a tradition that dates back to 1637. All our replica Celtic crosses are also available in white gold. Our charming collection of crosses includes a number of different designs like trinity knots, Claddagh crosses, and filigree crosses. These crosses are excellent presents for people who want to commemorate their Irish heritage or their Christian faith. They are available with or without chains and come in a presentation box making them the perfect gift for loved ones or even as a treat for yourself.